The first full-length trailer for Playmobil: The Movie is here. Thanks to The LEGO Movie, largely, Hollywood has been doing its best to snap up legacy toy brands and turn them into successful movie franchises. That has worked out well in certain cases, from a financial standpoint, for movies like Trolls, which is getting a sequel. But this is a project that comes with a certain degree of uncertainty and this first trailer only adds to that uncertainty. They say imitation is the most sincere form of flattery and, if that's the case, the team behind The LEGO Movie should be very flattered. Beat for beat, this trailer looks incredibly similar to what we got from Warner Bros. on that one. There are some differences, but the similarities are uncanny. Part live-action, but mostly animated in the likeness of a popular toy brand that involves mini toy figurines, with a sprawling adventure in a strange land made of these toys, all set to modern pop music. Yes, this is insanely similar. Will it be as good though? That truly remains to be seen. 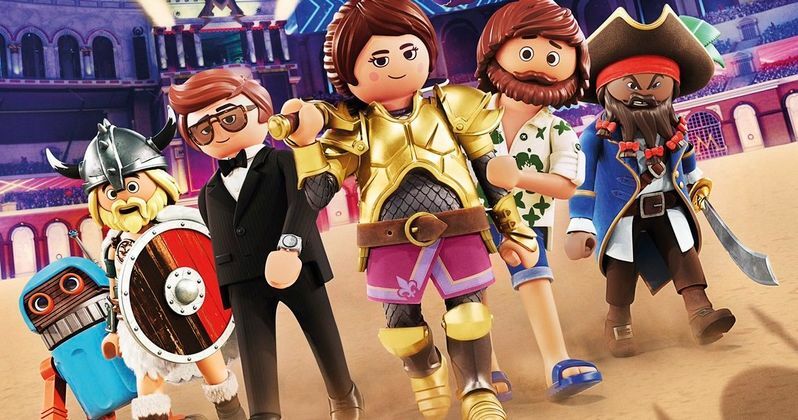 Playmobil: The Movie centers on an epic comedy adventure through a sprawling imaginative universe in the first movie inspired by the beloved, award-winning Playmobil toys. When her younger brother Charlie (Gabriel Bateman) unexpectedly disappears into the animated, yet very real, universe of Playmobil, an unprepared Marla (Anya Taylor-Joy) must go on a quest to bring him back to their reality. This sends her on a journey across amazing new worlds. Marla teams up with some unlikely and heroic new friends such a smooth-talking food truck driver named Del (Jim Gaffigan), a charming and charismatic secret agent named Rex Dasher (Daniel Radcliffe), fairy-godmother (Meghan Trainor) and more, including a robot with a big heart. The cast includes Anya Taylor-Joy (Glass, Split), Jim Gaffigan (Chappaquiddick, The Jim Gaffigan Show), Gabriel Bateman (Lights Out, Child's Play}), Daniel Radcliffe (Harry Potter, Swiss Army Man) and. Kenan Thompson (Saturday Night Live, Kenan and Kel) Pop stars Adam Lambert and Meghan Trainor also lent their voices to the movie. Longtime animator Lino DiSalvo, who has worked on hits such as Frozen and Tangled for Disney in the past, makes his feature directorial debut. The screenplay is credited to Blaise Hemingway, Greg Erb and Jason Oremland. Playmobil has a long-standing legacy in the toy world, as they date back to 1974 and hail from German creator Hans Beck. While they may not quite have the brand recognition that LEGO has, a certain number of people have a lot of nostalgic feelings about these little figurines, which could help drive some people to theaters beyond those parents who need something of the family-friendly variety to take their kids to. Playmobil: The Movie is set to hit theaters on August 9. Be sure to check out the first trailer from the StudiocanalUK YouTube channel below.